When Google Glass was launched in April 2012, it captivated the imagination of the world. Google unveiled what was then known as Project Glass with a concept video of how the wearable could potentially work and it looked amazing. The problem is that the reality was no where near Google's imagined future and over the course of the next two-and-a-half years the product died a slow death until Google shelved the project in January for an undetermined period of time. "I was a Google Glass Explorer and the experience was horrible from the start. Google Glass now sits in my office museum of failed products. The UI was terrible, the connection unreliable, and the info it delivered had little use to me. It was the worst $1500 I have ever spent in my life." The problem wasn't that Glass was a terrible idea, it was that people just expected too much because Google oversold its vision of the future. "The bad decision was that we allowed and sometimes even encouraged too much attention for the program," Astro Teller said at this year's South by Southwest festival. "Instead of people seeing the Explorer devices as learning devices, Glass began to be talked about as if it were a fully baked consumer product. The device was being judged and evaluated in a very different context than we intended." HoloLens going the way of Glass? When I tried Microsoft's HoloLens holographic computer for the first time at the company's Build 2015 developer conference, the demise of Google Glass is the first thing that came to mind. I was hugely excited to test HoloLens. It had been unveiled back in January as a complete surprise during the launch of the consumer version of Windows 10. While there were many that mocked the way people looked while wearing it, what I saw was a untethered, fully-functioning computer you wear on your head allowing you interact with the real and virtual worlds around you using natural, intuitive controls like voice, touch and gaze. Microsoft's on-stage demonstrations did little to quell the feeling that this was a truly breakthrough device which could be the future of computing. One demonstration showed the user transported to Mars, another turned your living room into a gaming landscape while another showed an Ironman-type setup of an engineer working on a motorbike. The second public outing for HoloLens came at Build at the end of last month (April), and again watching from the outside, it looked magical, with one demonstration showing how HoloLens could be used to train surgeons to operate on the human body. Just hours later I was given the chance to test out this game-changing technology for myself and my initial reaction was one of huge disappointment and being completely underwhelmed. That was until I realised what HoloLens really was and what it could do, and I readjusted my expectations. By the end of my time with HoloLens I saw the huge potential this device has, but Microsoft is in danger of falling into some of the same traps as Google Glass. 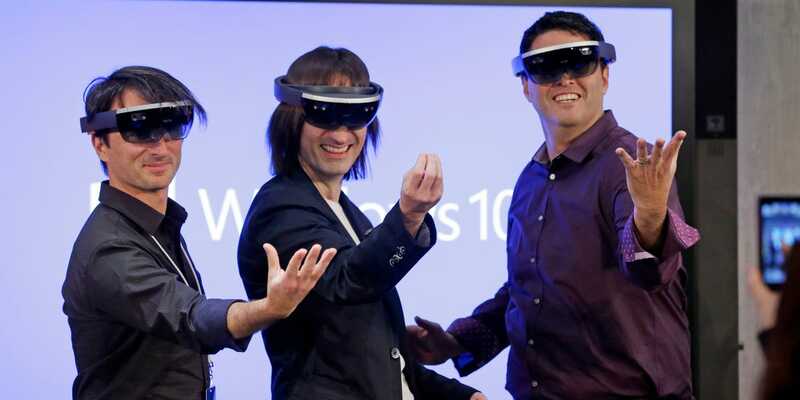 Microsoft is a company in need of a revolutionary product like HoloLens. Unlike Apple, Microsoft is seen as a stale and staid tech company, one which is associated with "boring" products like Office and Windows rather than the iPhone or iPad. The problem for Microsoft, is that while HoloLens may be revolutionary, it is not (yet) a mass consumer product like the iPhone or iPad. It is a hugely powerful holographic computer that is ideally suited to enterprise applications and that is where the company needs to focus its attention. Discussing the failure of Glass, Bajarin added that most hardware products have to go through several years of use in the enterprise before being widely adopted by consumers: "Most technology gets started and refined in what we call vertical markets well before they get perfected and priced low enough for consumers." The problem according to Bajarin is that Google priced Glass as if it was a specialised "vertical market" product but sold it to consumers and therefore expectations were never going to be met. "Products like Sony's Morpheus, Facebook's Oculus and even Microsoft's HoloLens will take aim at a higher-end gaming audience or those focused on virtual and augmented reality and be priced like vertical market products — well out of reach for the general consumer for a long time." Microsoft has yet to really reveal its plans for HoloLens beyond showing off the amazing technology in action. It has not said when it will launch, how much it will cost and crucially where it will be pitching the product - at consumers or at the enterprise? It would be easy for Microsoft to believe some of its own hype and try to cash in on the renewed interest from those who had previously written it off as "the Office company". Stay Nadella, the Microsoft CEO who has championed this product, has shown himself to be a savvy operator in the 12 months since taking charge, and he will be well aware of what happened to Glass and be eager not to let the same thing happen to his prize product. HoloLens, at least in the short term, will not be Microsoft's iPhone and the company needs to make sure that it tempers consumers expectations for what the headset can do. That means showing more realistic demonstrations and making it clear that this is a enterprise product first and foremost.